Each year, I look forward to releasing Women's World Banking’s annual report to share our progress toward bringing innovative financial services to women around the world. The women we serve are our inspiration and their lives are proof that the work we do is instrumental to stronger families, communities, and the global economy. In early 2015, the World Bank’s Global Findex provided us with a global “report card” on access to financial services around the world. The good news: the number of unbanked adults worldwide dropped by 20 percent; with 700 million more adults accessing financial accounts than in previous years. Less optimistically though, the gender gap in access to financial services did not shift at all—with a 7 percent gap globally and 9 percentage points in developing countries. Women in every region and income group are significantly less likely than men to have financial assets in their own names. This gap is as large as 18 percent in South Asia, 28 percent for women living on two dollars per day. The persistence of this gap is frustrating, but it is increasingly clear to me that gender parity in financial inclusion is a problem we can solve. Now more than ever, we know what it will take to get there. With generous support from our donors and enthusiastic collaboration with a greater variety of partners than ever before, Women's World Banking is learning, leading and investing. We’re learning more about how digital financial services can address the most critical barriers that women face when accessing financial services. We’re leading as an advocate on the global stage to shape policy that supports women’s financial inclusion. We’re investing in institutions and diverse leadership teams that will help us close the gender gap by serving women well. Read on to learn how we are working to close the gap in order to empower all women with financial services. How does a bank account empower a woman? She builds her business to support her family and save for the future. She has more control over the financial decisions within her family. She learns how to manage her finances and use savings accounts, loans and insurance policies. She gains a strong sense of self-confidence and vision for her future. A bank account empowers a woman to build a better life for herself and her family. Women's World Banking closely monitors the impact of our work around the world. Here's a glimpse of 2015. Women's World Banking is a learning organization, sharing knowledge with financial institutions and partners to research, design, promote and evaluate financial products for women around the world. Financial services delivered digitally can address longstanding barriers to formal financial services by offering women accessibility, convenience, privacy and security through new channels such as mobile phones and retail agents. W ith digital technology, a woman can open a bank account in her own name, plan for her future, and build a safety net for times of crisis. Working with commercial bank partners, Women's World Banking researched and designed digital savings accounts for women who are not currently using a bank either because it is too far away or they don’t think a bank is meant for them. Developed with Diamond Bank, BETA Savings is designed for women and men who run stalls in Nigeria’s open-air markets. Agents, knowns as BETA Friends, visit clients’ businesses to open accounts and handle deposits and withdrawals using a mobile phone. With NBS Bank in Malawi, we developed Pafupi (meaning “close” in the local dialect, Chichewa) Savings, which enables women to open accounts and make small deposits and withdrawals whenever they want at local shops with NBS Bank agents who transact via mobile phone. Women’s World Banking conducted research to learn how digital financial services for women can be a game-changing opportunity that paves the way for financial inclusion. Digital Savings: The Key to Financial Inclusion for Women? examines how various financial institutions, mobile network operators and even governments are successfully bringing digital financial services to low-income women. How is Pafupi Savings serving women? Low-income women see the account as designed for them. Half of all clients are actively saving, with regular deposits and few withdrawals. Over half of all transactions are performed with local agents using mobile technology. Despite the growth and contribution of small- and medium-sized enterprises (SMEs), there is a tremendous gap in their access to finance. More than 70 percent of women-led SMEs are estimated to lack adequate banking services. S MEs account for more than 90 percent of enterprises in the global economy and contribute about 50 to 60 percent of employment in the world. Women-led SMEs make up roughly a third of this market, the majority of which are in developing countries. 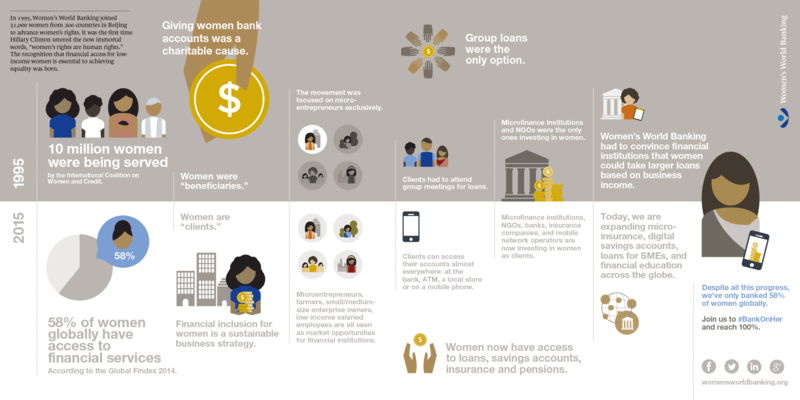 Women’s World Banking conducted research to better understand the unique needs of women-led SMEs and the financing options available to them. Commissioned by the European Bank for Reconstruction and Development (EBRD), this report presents global best practices for banks to develop successful strategies for reaching women-led SMEs. Commissioned by the Australian Department of Foreign Affairs and Trade (DFAT), this report examines women-owned SMEs in the Philippines, Vietnam, Cambodia, Myanmar and Indonesia; and it provides recommendations for government, private-sector players and development agencies to enable women's access to finance in these countries. To foster knowledge exchange among financial institutions serving women-led SMEs, Women's World Banking brought together five network members—Banco ADOPEM of the Dominican Republic, Banco WWB of Colombia, Microfund for Women of Jordan, Interfisa Banco of Paraguay, and enda inter-arabe of Tunisia. Participants visited TEB and Garanti Bank, two Turkish banks that are successfully targeting women-led SMEs. Microinsurance has enormous potential to provide security and stability to a poor household if the product meets women’s needs and they understand the benefits. M eeting the costs of an unexpected health emergency is the most common reason women give for having to liquidate or decapitalize their businesses. In 2010, Women’s World Banking worked with Microfund for Women (MFW) in Jordan to create Caregiver, a cash benefit after hospitalization that clients can use for a range of needs, such as hospital transportation or lost revenue replacement while their businesses have been closed. Caregiver enables clients to repay MFW loans after hospitalization and avoid additional debt. Clients using Caregiver showed increased financial literacy, including understanding the concept of insurance and product terms and conditions. Women with income-generating activities who have accessed both credit and Caregiver have a strong sense of self-confidence and a vision for their future, and they see themselves as having more control over decisions within their families. Caregiver is the prototype for Women's World Banking’s current microinsurance work in other markets, including Uganda, Egypt and Morocco. Making Finance Work for Women Summit: More than 200 attendees from 55 countries joined us in Berlin to zero in on key actions to increase women’s financial inclusion. A loan of her own: individual lending with Ujjivan Financial Services Pvt. Ltd.
We use our voice to help shape policy and engage global leaders. With more than 35 years of experience researching women's lives and designing financial products that meet her needs, Women's World Banking is a leading global advocate for women’s financial inclusion. We use our voice to help shape policy and influence global leaders who can help reach the one billion women around the world without access to financial services. We serve on the World Economic Forum’s Global Agenda Council, Future of Financing and Capital, advising on financial inclusion solutions specifically designed for women. In 2015, we provided concrete recommendations on how innovative uses of technology in financial services can address the needs of women-led small businesses. We were commissioned by the Alliance for Financial Inclusion (AFI), a global network of financial policymakers from developing countries, to conduct a study, Policy Frameworks to Support Women’s Financial Inclusion, on the role policymakers can play in closing the gender gap in financial access globally and to highlight best practice policies to promote financial inclusion for women. With support from DFAT, we assessed opportunities for employment and advancement for women at select banks in five Southeast Asian markets. Women’s Workforce Participation and Advancement in Southeast Asia will inform a new DFAT initiative to improve women’s economic participation and influence the private and public sector to promote women’s economic empowerment in the region. We were an Affiliated Partner of the G20’s Global Partnership for Financial Inclusion (GPFI) in 2015, serving as the advisor for women’s financial inclusion. We co-authored Advancing Women’s Economic Participation: How Digital Financial Solutions Can Bring More Women into the Global Economy, which was shared as part of the G20 Leaders Communiqué as best practice recommendations in advancing women’s financial inclusion. During Germany’s 2015 G7 Presidency, Chancellor Angela Merkel made women’s economic empowerment a cornerstone of her policy framework. Given this focus, the German government asked us to hold our biennial Making Finance Work for Women Summit in association with Germany’s own G7 event on women’s economic empowerment. We celebrated the 20th anniversary of the Fourth World Conference on Women held in Beijing, China. In 1995, Women's World Banking influenced the conference platform to include women’s access to financial services. This year, we hosted The Clinton Foundation’s No Ceilings Project and UN Women’s Empower Women for a Twitter chat to celebrate the progress made on women’s financial inclusion and share ideas on where the gaps still exist and how to address them. Investing in women provides both social and financial returns. In order to meet the needs of the one billion women globally who lack access to financial products and services, financial institutions need capital from investors who understand that investing in these women can provide both a social and financial return. It also requires leadership teams that are well-trained, diverse and focused on their mission. W omen’s World Banking Capital Partners, LP (the Fund) is a private equity limited partnership that makes direct equity investments in women-focused financial institutions. This new venture, with more than US$50 million under management, demonstrates what Women’s World Banking has long maintained: providing women with access to financial services can be a profitable business for banks, while contributing to the economic growth and welfare of families and communities. During 2015, the Fund deployed capital to foster responsible growth of financial institutions that serve low-income women while creating capital appreciation for investors. In total, the Fund has made five investments in four countries, deploying US$20 million. Serving communities across Bolivia since 1984, BancoSol provides high-quality financial services to the low-income market. With the Fund’s investment, BancoSol committed to making women a central part of its growth strategy and has since become an active participant in Women’s World Banking’s knowledge sharing initiatives. India’s Ujjivan has a long history with Women's World Banking—a network member institution since 2008, CEO & Managing Director Samit Ghosh is also a member of the Women's World Banking Board of Trustees. As an investee of the Fund, Ujjivan enjoys an even deeper engagement with Women's World Banking complemented by technical assistance in product development. L oise attended Women’s World Banking’s inaugural Leadership and Diversity for Innovation Program in 2015. She joined 14 fellow senior executives from financial institutions committed to serving women, representing a diverse range of markets, including Colombia, Pakistan, Malawi and the Philippines. For the one-year program, Loise paired with Susan Wakonyo, head of customer care at Equity Bank, who was identified as a potential leader within the organization. They participated in separate, complementary leadership programs—including executive training from the Wharton School of The University of Pennsylvania and remote coaching by Creative Metier. Loise played the role of sponsor, supporting Susan to develop her own leadership vision. All two-person teams participating in the Leadership and Diversity for Innovation Program also worked on a real-time challenge facing their institution related to successfully serving low-income women. These challenges ranged from creating inclusive and gender-diverse work spaces to using technology to reach women in the lowest income segment. Loise and Susan continue the initiative in Kenya. Women's World Banking checks in regularly as part of a robust monitoring and evaluation framework for all participating institutions to measure the success of both the individual leaders as well as the strategic business initiative. Together we’re making finance work for women. Introducing our trusted advisors, supporters and partners around the world. Friends of WWB/USA, Inc. is a 501(c)(3) tax-exempt organization, which raises donations from U.S. foundations, corporations and individuals in support of Women’s World Banking’s global mission. Friends of Women’s World Banking maintains a separate Board of Directors comprised of leaders in law, business, marketing, finance and academia who provide fundraising capability and strategic guidance on Women’s World Banking’s global initiatives and U.S. presence. Thank you to Hollis Rafkin-Sax for her board service, which concluded in 2015. Formed in 2014 under the auspices of the U.K. Department for International Development’s Financial Sector Deepening Africa program, the Africa Advisory Council informs Women’s World Banking’s regional strategy and advocates for women’s financial inclusion across Africa. Thank you to Arunma Oteh for her council service, which concluded in 2015. Women’s World Banking relies on its core funding partners to make our operations possible. We share mandates to promote gender equality and increase financial inclusion. Women’s World Banking values the reciprocal relationship it has with each core funder. We are proud to partner with these leaders in the development community and are very grateful for their strategic inputs and financial support. Delta Life Insurance Company, Ltd.
- Mr. Ms. Mrs. Dr. Prof.